Margo was top of her class, graduating with degrees in mechanical engineering and physics. However, what distinguished her was not the achievements themselves but rather how she achieved them. She seems to have an innate understanding of engineering, approaching savant levels. Margo appeared on the agencies' radar when a purchase of Hafnium was flagged. Fearing that someone may have weaponized an isomer bomb, she was investigated. 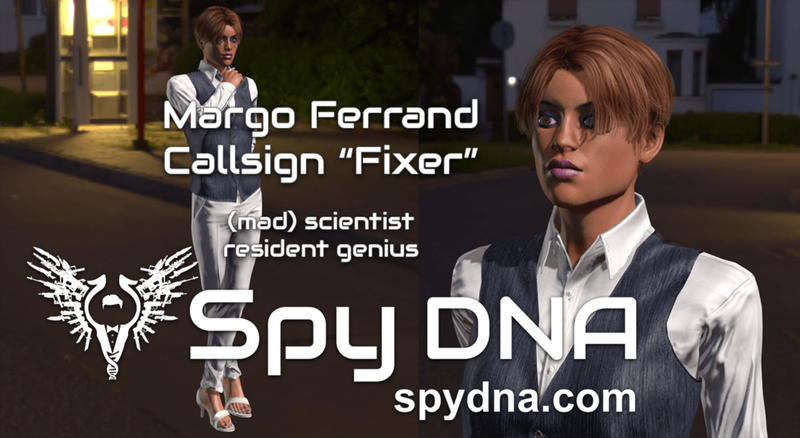 As it turned out, Margo had in fact solved the problem of controlled energy release, and was building something with it, but it turned out to be an engine for her race plane. This led to her recruitment, where being able to work with crazy and dangerous things without being prosecuted by the government had its appeal. Margo strongly dislikes the corporate world due to the management structure of most companies, which constrains her free-spirit nature and ability to improvise on the spot, rather than spending months planning. Margo is a world class pilot and driver. She has won several flying and driving competitions. She was approached by several professional racing teams but declined, because she didn't want to be constrained by contractual obligations. Margo excels in a chaotic world. When playing multiplayer games she often stirs up chaos and confusion until most players devolve into panic, then she will seize the the opportunity. Socially Margo is easy going and very relaxed. She has trouble relating to people of anything less than slightly above-average intelligence. She has a very good relationship with both Tanko and Nuri.